I’ve often expressed my dislike of YA-themed stories,mostly due to the sameness and predictability of the stories themselves and/or the characters they focus on, yet this book caught my attention because a few reviews I read stressed its very difference from the usual fare. They were quite right. In this case the story does not rest on the usual, tired trope of the exceptionally gifted but neglected girl who falls for the brooding guy with a secret, nor on the equally abused love triangle. The main characters are two girls who form a strong bond of friendship to survive dramatic circumstances: a refreshing point of view that breathes new life into the sub-genre. The world depicted in Radiant is a post-apocalyptic but quite fascinating one, since magic is its main driving force and the ability to use magic is the discriminating factor that determines a citizen’s status. It’s not explained whether the rise of magic is a consequence of the world’s present conditions or if it always existed, and in truth it makes little difference concerning the story itself: what matters is the social divide it creates. Those who are able to wield magic dwell in the Towers, floating enclaves high above the ground, where they enjoy a good quality of life literally turning their ability into currency, since coins are magically engraved with the needed value. On the other hand, those who possess little or no magic are condemned to stay on the ground, in the Lower City. Here rest the decaying remnants of a previous civilization, one that was destroyed by some unspecified disaster: people who live at ground level must deal with scarcity of food, of shelter and even of personal security, eking out what’s essentially a life of scavenging through the previous civilization’s debris. This is one of the first powerful visual impacts provided by the book: the Towers, floating high in the sky like some kind of unattainable goal, or even a dream; and the Lower City, where life is drudgery by day and danger at night when zombie-like creatures that used to be people roam the streets in search for prey. There is a sort of middle ground as well: the skyscrapers (or what remains of them), where organized power-holders – halfway between crime lords and petty barons – indenture the grounders in exchange for food and protection. 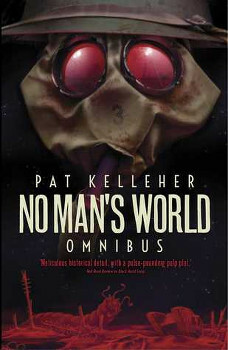 This post-apocalyptic world is not only well-defined, but also believable because of its peculiar blend of advanced civilization and magic: the ruined buildings, the cracked pavements, the dirt and shabbiness of the Lower City take life and consistency under the author’s inspired descriptions, presenting the reader with an almost cinematic quality to the images created by her words. Xhea, one of the two main characters, possesses no magic and manages a hand-to-mouth existence by relying on the unique talent that enables her to see ghosts: acting as a conduit between the living and the dead she gets paid in magic, both to buy whatever she needs to survive and to get a sort of high, as if from a drug, from the passing effects of the magic she acquires. The day she is contacted by a wealthy man from the Towers to take temporary charge of the ghost he’s tethered to, Xhea’s life changes dramatically: the ghost is Shai, the man’s dead daughter, and she’s a special person, a Radiant – people whose magical powers are so abundant that they are all but enslaved by their home Towers to manage energy needs, even if that condemns them to a short and pain-filled life. The relationship that oh-so-slowly blossoms between these two girls, these polar opposites, is the backbone and main strength of the book: where Xhea is a loner, an outcast and therefore distrustful of everything and everyone, Shai still retains the innocence and sweet disposition of her privileged life. Once they find themselves on the run from exploiters who seek to recapture Shai’s ghost to force her into another body, so she can resume her duties as a human power plant, their characters begin a fascinating osmosis that changes them profoundly and forces them to grow beyond their years. Xhea’s transformation is a fascinating process to behold: she starts as a self-centered, almost selfish creature who has built high walls around herself as a form of defense, and a few flash-backs into her past show how and why she now needs that kind of barrier against the world. But contact with innocent and trusting Shai changes her, little by little, from an indifferent handler to a fiercely protective guardian for her ghostly charge. At first she treats the ghost girl as just another “job”, as a non-entity, but as she uncovers the terrible truth about Radiants and the way they are enslaved and exploited, Xhea becomes more than determined to save her friend, risking everything in the name of that friendship and the bond they established. This was one of the most difficult sides of the book for me, having to witness the levels of pain and distress that Xhea endures to reach her goal: Sumner-Smith pulls no punches when it comes to her characters, and I must confess that at times it almost hurt to keep on reading, such was the level of empathy I reached for them. Which means that the author was doing her job quite skillfully…. 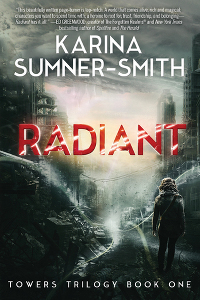 As a debut novel, Radiant is an extraordinary and engrossing discovery, one that introduces a welcome difference into the sub-genre, breathing new life into some of its most used (and abused) tropes. I’m looking forward with pleasure to the next books in this series. A true master knows where all the pieces are at all times. Others may think they have taken control but alas, the master knew their last move before they played it. In the Empire of Azad a complex game (also named Azad) is the means through which the players gain social status and political clout. 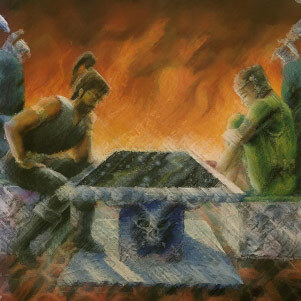 It’s a complex game whose rules and outcome vary depending on the player’s mindset and goals, and is played on three-dimensional boards large enough for the players to move around and to act directly or interact with their “pieces”. Players can either compete against each other or form alliances to outnumber and defeat other opponents. Jernau Gurgeh travels from the Culture to Azad to compete in the game, and he is extremely successful but… is he the real mastermind behind it all? Or is he just a pawn through which Special Circumstances is moving its own pieces to play its own game and direct the fate of the Empire? Who is the player and who is being played here? By being unknowable, by resulting from events which, at the sub-atomic level, cannot be fully predicted, the future remains malleable, and retains the possibility of change, the hope of coming to prevail; victory, to use an unfashionable word. In this, the future is a game; time is one of its rules. Always keep your foes confused. If they are never certain who you are or what you want, they cannot know what you are like to do next. Sometimes the best way to baffle them is to make moves that have no purpose, or even seem to work against you. Remember that, Sansa, when you come to play the game. There are times, as I read a synopsis, when my “book radar” pings a bit louder than in other instances, so that I’ve learned to pay attention to that kind of signal because it usually leads me to great discoveries. 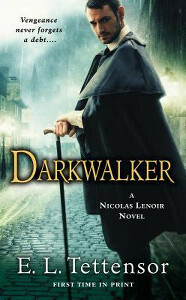 Darkwalker, an intriguing debut novel, was indeed such a case. Nicolas Lenoir used to be a brilliant police inspector, one of those around whom legends are built, but now he’s both disillusioned and uncaring: on one side he cannot summon the old passion for his work anymore, on the other he’s haunted by old nightmares that have far more substance than simple dream stuff, and threaten his very life. Even a series of gruesome grave profanations fails to raise his interest, until one of his informants, a young street urchin, is kidnapped and Lenoir finally seems to wake up, throwing himself into a hair-raising chase that will force him to face his fears head on. E.L. Tettensor paints a very interesting world here, since the flavor is that of 19th Century England, but the setting is quite original: the Five Villages sport many of the features one would expect of Victorian London, even though they’re set in a far more rural context; the class divisions are quite marked and there are clear indications of social injustice, though the author treats that with a very light, non-preaching hand; the background scenes of everyday life are painted in vivid detail and made me feel the reality of this world in an effortless way. What makes a substantial difference here is the introduction of the Adali, a nomadic people organized into tribes, whose culture is explored at great length: they are the object of general scorn and suspicion, and the preferred target for the populace’s malcontent whenever a scapegoat is needed. The author blended very well the various notions and discoveries about the Adali into the narrative, adding some magic elements in an organic and satisfying way that is one of the novel’s main strengths. The characters are the driving force of the story, though, starting with the protagonist Nicolas Lenoir: I was surprised at the level of interest I could summon for a character that is at first presented in a very negative light, since Lenoir is jaded, arrogant and distant, and makes no effort to hide it. I think this was a bold move from Ms. Tettensor, to present such an unlikely “hero” at first, adding details along the road and giving her readers a different understanding of the character only when the story is well underway. A bold move, but a winning one as far as I’m concerned, because despite that negative first impression there were some subtle hints that kept me reading and that paid handsomely in the end. The roots of Lenoir’s detachment reach far into his past, when he barely escaped a frightening creature of darkness bent on destroying him: the patches of necrotic flesh on his arm, resulting from contact with the creature’s deadly whip, are a constant reminder of that fateful night and of the hopelessness of the situation, because he knows the Darkwalker will find him eventually and exact its vengeance for the crime against the dead Lenoir is guilty of. Not much is explained about this, and hopefully it will in the next books (another feature I enjoyed, because some mysteries must remain unsolved…) but it showcases the inspector’s character quite well, and if it doesn’t effect a complete change in attitude, it highlights parts of his psychological makeup in interesting ways, filling out his personality and offering a deeper view into what makes him the person he is. The Darkwalker itself is a fascinating creature: tasked (or condemned?) to avenge crimes committed against the dead, it sees through their eyes the faces of the perpetrators and marks them for punishment, and death. In the exchanges with Lenoir, there are hints about the creature’s possible lack of will, because it sometimes refers to an external directive, as if the shadowy, green-eyed being were nothing but a instrument carrying out someone (or something) else’s directives. There is a mixture of relentlessness and matter-of-factness in this being that is both intriguing and frightening, and the swift, almost subliminal flashes of long-forgotten humanity that sometimes show through add to the fascinating mixture in a major way. Sergeant Kody, Lenoir’s deputy, is another interesting figure: a young man attracted by the inspector’s aura of brilliance, only to suffer from severe disappointment when he realizes his idol has clay feet and the clay is cracked in too many places. There is little room in the fast pace of the story to allow for much development of Kody’s character and for the tense relationship between the two men – the disillusioned veteran and the junior officer still animated by the sacred fire – so I hope that the following novels will find more room for what promises to be an intriguing personal dynamic. The secondary character that literally stole my heart, however, is Zach, the orphan, street urchin and sometimes informer who attaches himself to Lenoir and by association manages to bring forth the inspector’s better instincts. Children are a tricky subject to handle, since they can come across as overly cute or just annoying, but that’s not the case here, because Zach is such a perfect, successful blend of wounded innocence and street wisdom that he endeared himself to me from the very start and often stole the scene with his quiet intensity. Well, we all know that knights have been idealized for centuries: some of them were rich and noble (both in lineage and character), but others were in the game just for the spoils, or other reasons. And some of them were not guys at all… So, let’s explore the other half of the equation! 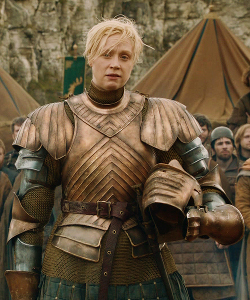 The only surviving offspring of Lord Selwyn Tarth, and always more inclined to martial arts rather than the typical feminine endeavors, she felt free to indulge in her desire to be fighting knight when her father gave up arranging a marriage for her, given the lack of interest shown by prospective suitors and Brienne herself. Her concept of knighthood is more idealized than the reality of Westeros affords, and she always clings tenaciously to the concepts of loyalty and honor, even when it means paying a stiff price for it. Awkward and ungainly in appearance, she is nonetheless a fierce and determined warrior, the kind one would want at their side in a tight situation. The half-human, half fae private investigator living in San Francisco, she is also a knight, invested with this title by her liege lord, Silvester Torquill. She might not ride a horse and face enemies with sword in hand, but still – like a knight – she fights for those who can’t defend themselves, more often than not facing huge dangers and bodily harm, but always determined not to fail those who ask for her help. She’s a hard-edged heroine with a well-hidden softer side, as her squire Quentin can undoubtedly witness. If you need rescuing, Sir October Daye is the right one to call for help! Maybe not a knight in the true sense of the word, but she was indeed a warrior, queen of a Celtic tribe and leader of an uprising against the Roman occupation army. Keeping the enemy on its toes for a long time, she caused them to fall back and even to consider retreating completely from Britain. Unfortunately, she was finally vanquished, but her name and actions inspired several legend and became a cultural symbol in the UK. Here I might be stretching a little the definition of “knight”, but Monzcarro “Monza” Murcatto is a soldier, tactician and fearless leader of her troops, who held her in high esteem: she is a mercenary in the employ of Duke Orso and she falls victim, together with her brother, to the Duke’s paranoia and thrown down a cliff to die. Surviving by pure miracle, she swears vengeance of the Duke and the people who aided and abetted his actions, and carries it on with ruthless efficiency. Grimly determined, used to pain, uncaring of the scars that her life as a soldier and the attempted murder have left on her, Monza is an unusual heroine, not necessarily on the side of the “good guys”, but she’s certainly an unforgettable character. I received this book from NetGalley, in exchange for an unbiased review. The first time I read about the concept for this story I was intrigued: a battalion of soldiers fighting on the Somme, during WWI, is mysteriously transported on another planet, where they find themselves fighting another kind of war, against a hostile environment and predatory creatures. So, when I signed up at NetGalley and started browsing around, one of the first titles I saw was the omnibus containing all three novels in this series, and requested it right away – luck was with me, because I was swiftly granted the book. The first thing I noticed, as I started reading, was the amount of research work that must have gone into crafting the background for the story: the details of trench life, warfare and of the day-to-day hellish existence of those soldiers are quite sharp and contribute to create a very clear image of the living conditions on the battlefield. Sometimes those details can be overwhelming, what with unusual terms and military jargon, but once the reader gets into the “vibe” of it all, it helps the immersion in the story itself, even when it shows the most unsavory aspects of it all. It’s a known fact that life on the front is no walk in the park, but what WWI soldiers had to face was particularly awful: those young men had left home driven both by patriotic feelings and the desire to find honor and glory, sometimes even to escape dreary lives, but what they found in reality was worse than a nightmare. The trenches meant dirt and mud, rats and body lice; cold, discomfort and unpalatable rations, and this was just the setting, because the constant shelling, the sorties that meant heavy casualties, the awareness of an enemy always ready to pounce and the horrid consequences of wounds, given the poor level of medical treatment, were enough to sap even the strongest of characters. All this is rendered with stark realism, from the observation of the soldiers’ reactions during an attack or of their rare moments of quiet, when they find in shared camaraderie and in news from home a way to forget the cruel reality of warfare. Also quite real is the huge divide between the troops and the officers (some of them men as young and inexperienced as their underlings, but denied the luxury of showing fear and uncertainty) because it mirrors the social barriers that were in force at the time. With these premises, I should have enjoyed the book – or rather books – quite a bit, but unfortunately the rich setting was offset by a characterization that was not as carefully rendered as the background. I’m aware that a plot-driven story must focus more on events than on the figures peopling them, but still I need some fully-fleshed characters to enjoy it: with the exception of Private “Only” Atkins, whose back-story is detailed in some depth, the other individuals are painted with such broad strokes that I found it difficult to care for them. Even the evil officer Jeffries, despite the satanic rituals and bloody trail of corpses behind him, failed to appear like a believable menace, and instead looked more like the proverbial mustache-twirling bad guy than a flesh-and-blood person. Once the soldiers found themselves transported into an alien world, I would have expected more of a reaction after the initial shock and disbelief had been processed. Instead these men choose to stay in the trenches, carrying on with “business as usual” while waiting for an unlikely rescue: no sense of wonder, no desire to know what had happened to them. Yes, there were forays to procure food and water, but the men showed no inclination to understand the world they had been brought to, or to look beyond the restricted confines of the corpse-riddled section of mud they had been transported with. A further point of puzzlement came from the liberal use of ammunitions and explosives, with no one mentioning the dwindling supplies or the fact that they could not be replenished. Worse still was the lack of perceivable reaction to the heavy losses suffered from the hostile environment: it was a jarring contrast with the realistic portrayal of the soldiers’ behavior in the first part of the novel. My suspension of disbelief was stretched even thinner at the first contact with the planet’s indigenous dwellers: both the humanoid-looking ones and the insectoid “master race” spoke fluent English, with mannerisms and frames of reference not unlike those of their unexpected visitors. That was indeed my turning point, the factor that brought me to finish at least the first book of the omnibus, The Black Hand Gang, but to go no further: when I lose faith in a story, in its ability to take hold of my imagination and carry it elsewhere, it means that something vital is missing. I don’t mean to say that this is a bad book, but it does not fulfill my own requirements for a compelling story. At times it reminded me of those ‘50s or ‘60s movies, where characterization and believability were sacrificed in the name of moving the action forward at a fast pace: here some of the narrative choices were quite over the top, especially while picturing the consequences of meetings with the local flora and fauna. Nothing wrong with that either, but not exactly what I look for in a book. Clearly not my “cup of tea”. I have to confess that I was quite puzzled when I first read the above, not only because of my abysmal ignorance concerning The Princess Bride, from which the quote comes, but because it took me a while to get my bearings (thanks, Google!). Thankfully, the last sentence contained all the guidance I needed… So here we go with True Love! This couple is one of the best fictional examples of attraction of the opposites, and of the osmosis that can happen when two people are on the same wavelength. Cordelia is the captain of a Betan cartographic survey ship and comes from a liberal culture, while Aral is quite the son of Barrayar’s militaristic and war-mongering society: when he captures her on a newly discovered world they go through some hardships that help them discover the real person behind their respective worlds’ propaganda and they fall in love. Cordelia admires Aral’s integrity and deep-seated sense of honor, and Aral enjoys Cordelia’s strong, uncompromising attitude: what makes them so great together, so believable as a couple, is the true partnership standing at the basis of their relationship, a partnership that will help them present a united front first against both their governments, that look with suspicion on their marriage, and against the blows destiny deals them, especially when their only son, Miles, is born crippled due to an attempt on their lives. Love, willingness to understand each other and a strong bond that transcends cultural heritage are the ingredients that make them who they are. When Paul Atreides, on the run from the Harkonnens who have killed his father and want to wipe out the whole Atreides line, meets Chani for the first time he understands she’s the woman he’s often seen in his prescient dreams. She’s the daughter of Arrakis’ imperial ecologist, a man who choose to ally himself with the desert-dwelling Fremen, and she’s the person tasked with showing Paul the ropes of life in the unforgiving Arrakis desert. That they were predestined to fall in love is clear from Paul’s dreams and they share a strong understanding of what it means to be a Fremen, and to cherish the harsh beauty of Arrakis. Even though politics will prevent Chani from becoming Paul’s true wife, she is the only one who holds the keys to his heart. To me, this is one of the most delightful love stories to have ever graced the big screen: Wall-E is a small robot tasked with the compacting of the huge amounts of trash piled on Earth, long since abandoned by its inhabitants. E.V.E. (Extraterrestrial Vegetative Evaluator) is one of the robot probes periodically sent to Earth to ascertain if life is still possible among the tall trash heaps. Where Eve is all business and robotic efficiency, Wall-E is capable of feelings and animated by strong curiosity about the long-gone planet dwellers: when they meet, they change each other profoundly and at the same time they trigger humanity’s drive to return to their ancestral home. 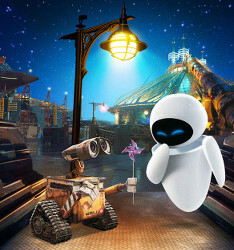 Even though they are both mechanical constructs, Wall-E and Eve are a tender and enchanting couple, and rooting for them – and the inevitable happy ending – is far from difficult. This is one of the titles that pinged on my radar while reading various posts from Sci-Fi November, a blogging event with the goal of celebrating various expressions of speculative fiction: while I had been aware of Lexicon‘s existence for a while, for some reason it had never fully crossed my attention threshold – which is a pity, because it was both an amazing discovery and a totally engrossing book. Everyone’s making pages for themselves [….] It’s the biggest data profile ever. And it’s voluntary. That’s the funny part. People resist a census, but give them a profile page and they’ll spend all day telling you who they are. We follow two story-lines, jumping back and forth between present and recent past: one of them concerns Wil Parke, a quite ordinary guy who finds himself in extraordinary and terrifying circumstances. The first time we meet him, he’s being assaulted in an airport bathroom by two individuals who submit him to a barrage of strange questions after inserting a needle in his eye. Wil’s total bewilderment and fear are quite understandable, more so when he’s told he’s the only survivor of a devastating incident that killed the whole population of the small Australian town of Broken Hill – something he has no knowledge or memory of. 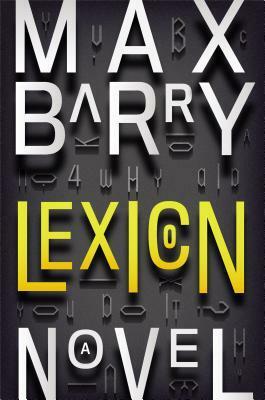 Little by little, the readers learn – together with clueless Wil – of the existence of a secret society able to exercise mind control on individuals through the use of specific words, wielded by expert “poets” who can manipulate people in this way. What makes Wil special is that he’s an “outlier”, i.e. someone who is capable of resisting a poet’s suggestion: this, and his connection to Broken Hill, have put his life in danger, and the hair-raising situations he find himself in – in turn aided, goaded and threatened by the poet calling himself Eliot – drive the very beginning of Lexicon, drawing the readers straight in and hooking them in no time at all. The other main story thread concerns Emily Ruff: a sixteen-year-old runaway managing a hand-to-mouth existence through card tricks played in the streets of San Francisco. Her ability to persuade her marks to part with their money comes to the attention of a talent scout who convinces her to take a test that might gain her admission to the prestigious poet school. The former street urchin takes to the school’s program like a fish to water, and yet it’s impossible not to perceive that something is very wrong with the whole system, as Emily keeps pushing the boundaries with a persistence that is at the same time bold and self-destructive. Emily is an interesting combination of outward strength and inner frailties that endeared her to me despite her brittle, sometimes annoying approach: it’s clear that the organization that enrolled her manipulates its adepts just as much as it does the common man, and Emily’s response is to rebel against such pressure – she keeps doing that until her actions bring about a devastating consequence, one that condemns her to a few years’ exile to the remote town of Broken Hill. What happens there, the wanton slaughter covered as a toxic spill, comes about through the use of a bareword, an object so powerful that it can keep alive any kind of suggestion, affecting everyone who comes in contact with it. With hindsight, I wondered if Emily’s acts of rebellion and the choices she made were indeed her own choices, and not rather the product of some subtle manipulation whose goal was to bring her to Broken Hill to fulfill a role in what looks like a twisted experiment: we can see Emily struggle with her nature, and with the realization of her power, and the inescapability of it all contributes to make her a sympathetic, if tragic, figure. Both storylines keep the book’s pace fast and riveting, building a constant momentum that’s also driven by the unusual progression of the narrative, since it keeps switching between time frames and therefore requires a tight focus. What constitutes the main strength of the novel is also at the basis of my disappointment at the ending, too abrupt and somewhat unsatisfying, if one takes into account what preceded it: I’m not a fan of long, convoluted explanations and I enjoy a book when it requires some hard work on my part, but this ending left too many unexplained details, too many unanswered questions to be totally rewarding, not to mention that it seems to reach for some predictability that, in my opinion, clashes with the story’s general mood. Nevertheless, it was both an amazing discovery and a great read, one that I can recommend with absolute conviction.